5 Movies Like The Mummy That Prove Some Tombs Are Better Left Unopened! In the mood for more old-school monster movies and archaeological heists? You need to watch these five movies like The Mummy! They’ve got it all! Action, adventure and just a little bit of camp. Curse of King Tut’s Tomb, I’m talking to you. If you haven’t heard about it yet, The Mummy is an upcoming movie that will hit theaters on June 9, 2017. It is a reboot of the trilogy from 1999, 2001 and 2008. Here are some other amazing movies like The Mummy. National Treasure is a 2004 adventure heist movie that is the prequel to the 2007 movie National Treasure: Book of Secrets. Benjamin Franklin Gates, a cryptologist, historian and treasure hunter, must find the ancient Templar Treasure before a group of mercenaries locates it. National Treasure stars Nicolas Cage as Benjamin. Sahara is a 2005 action, adventure, comedy movie that is based on the 1992 book of the same name by Clive Cussler. Dirk Pitt, an explorer and his partner, Al Giordino, head out on an adventure in West Africa’s deserts in search of a lost battleship from the Civil War. Sahara stars Matthew McConaughey as Dirk and Steve Zahn as Al. The Curse of King Tut’s Tomb is a 2006 fantasy adventure movie. Danny Fremont, an archaeologist, believes that finding King Tut’s Emerald Tablet would change the world. Also out to find the tablet, to use it to evoke evil on the world, is Morgan Sinclair, an Egyptologist and Fremont’s rival. The Curse of King Tut’s Tomb stars Casper Van Dien as Danny and Jonathan Hyde as Morgan. Indiana Jones and the Kingdom of the Crystal Skull is a 2008 action adventure movie that is the 4th installment in the Indiana Jones movie franchise. The other 3 movies are: Raiders of the Lost Ark in 1981, Indiana Jones and the Temple of Doom in 1984 and Indiana Jones and The Last Crusade in 1989. Dr. Henry “Indian” Jones, a famous adventurer/archaeologist, becomes entangled in a Soviet Union scheme to find out the mysteries behind the Crystal Skulls artifacts. Indiana Jones and the Kingdom of the Crystal Skull stars Harrison Ford as Indiana. Gods of Egypt is a 2016 fantasy movie. Bek, a mortal Egyptian hero and Horus, the Egyptian God of Air, team up together to face off against Set, the Egyptian God of Darkness. Gods of Egypt stars Brenton Thwaites as Bek, Nikolaj Coster-Waldau as Horus and Gerard Butler as Set. 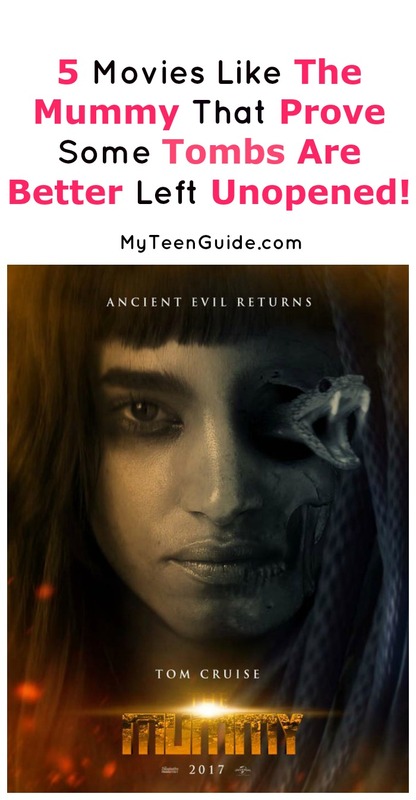 After watching these movies like The Mummy, I bet you’ll rethink that trip to explore the ancient ruins of Egypt and toss open a few tombs, now won’t you? Okay, so that was never really on my travel bucket list (um, not that I’d admit, anyway). Don’t forget, Fandango has a great “gift with purchase” special going on to celebrate the June 9th release of The Mummy. Get $5 monster movies on FandangoNOW with ticket purchase. Offer valid 5/19-6/12. Terms apply. What are your favorite adventure movies like The Mummy? Share below!